Rev. Philip Burroughs at the Gravestone of Rev. Joseph T. O'Callahan, S.J. Rev. 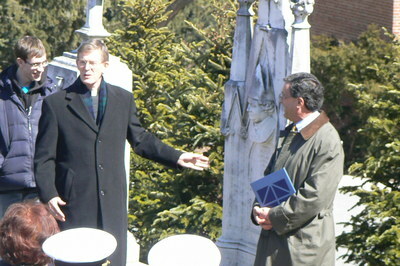 Philip L. Burroughs, S.J., President of the College of the Holy Cross, stands at the gravestone of Bishop Benedict Fenwick, S.J. and addresses those gathered in the Jesuit cemetery at the College of the Holy Cross for a wreath-laying ceremony marking the 50th anniversary of Fr. O'Callahan's death. Rev. Joseph T. Calahan S.J., 50th anniversary, College of the Holy Cross, Jesuit cemetery, tombstone, Rev. Philip L. Burroughs S.J.